Makalawena Beach is not the most easily accessible beach on the Big Island, but it is easily one of the most beautiful and well worth the little bit of effort it takes to get there. To get to Makalawena Beach, you have two options. 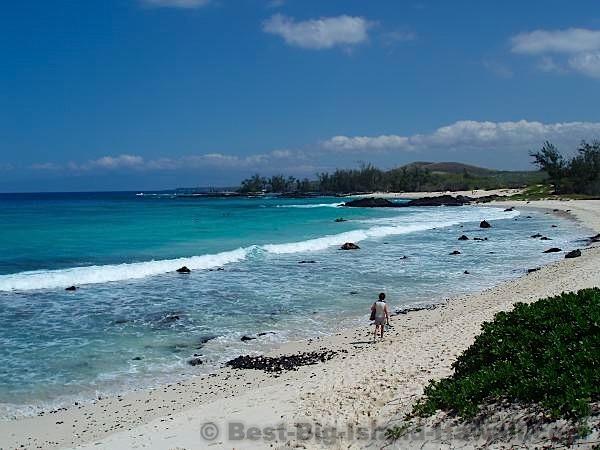 The easiest is to drive to Kekaha Kai Beach and from there to walk North and approach Makalawena Beach from the South. Start out on Highway 19 and turn towards the ocean between mile markers 90 and 91. You will see a sign for Kekaha Kai Sate Park. This road is mostly unpaved, but just about any car can handle it. Just take your time. It will take you about 5 minutes to drive to the end of this road where you'll likely see other cars parked on either side. Find a spot and unload your stuff. Remember that you'll be carrying everything for 20-30 minutes, so pack accordingly. From this parking area, you'll walk North, through a gate and along the path towards the trees that you'll see a couple hundred yards ahead and on your left. These trees form the back of Kekaha Kai Beach. But you're not going there today. Today you're resisting the urge to simply stop at this perfectly beautiful spot for the greater reward of the isolation and pristine beauty of Makalawena. 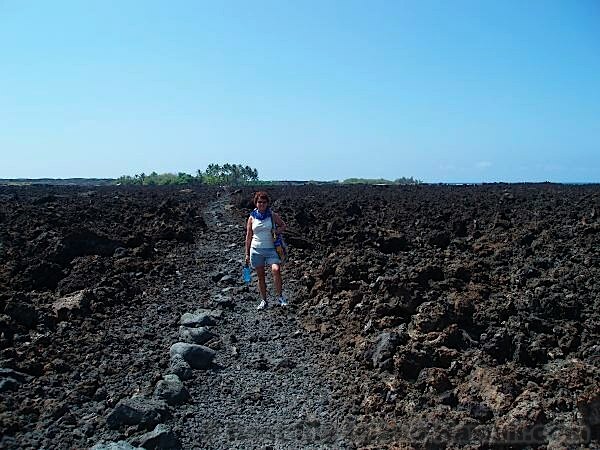 The path will take you to the North end of Kekaha Kai Beach where you'll continue on the path, through the lava field for about another 20 minutes until you get to the sand dunes. Don't worry, it's not a mirage, you've arrived. At this point just head towards the ocean. 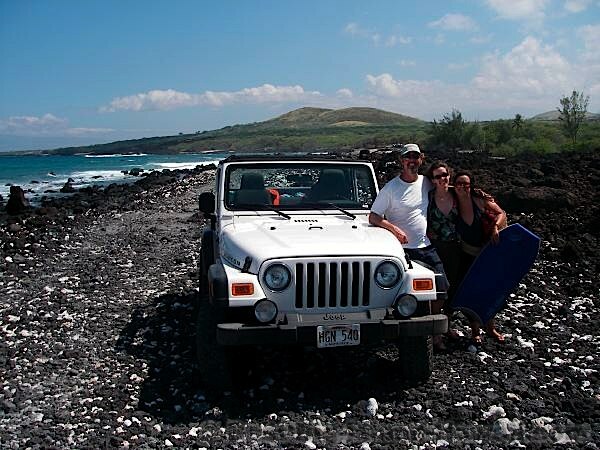 The second way to get to Makalawena Beach is to drive there. This drive requires a real 4 Wheel Drive vehicle (one with some decent clearance) as well as some skill at handling very uneven terrain. If you decide for this route, you'll turn off of Highway 19 almost exactly half way between mile markers 88 and 89. The beginning of this road is not very easy to spot. It's a little less than 1/4 mile south of the paved road that takes you to Kua Bay and it's really the only other road between these two mile markers. The first bit of driving is not so bad and you'll think that I was over reacting when I told you here that it is nasty. When following this road, always stay to your left when you have an option and you'll end up going the right way. As you leave the lava rock, you'll feel like you could be in the middle of Africa on Safari. Keep driving until you get to the ocean where you'll follow the "road" (I use that term loosely here) along the rocky beach. Eventually, you'll drive across a strip of black lava rock mixed with while coral where you'll probably see other vehicles parked. There is a gate at the end of this road, which is as far as you can drive. Make sure to park somewhere where you won't be in the way of other cars coming or going. 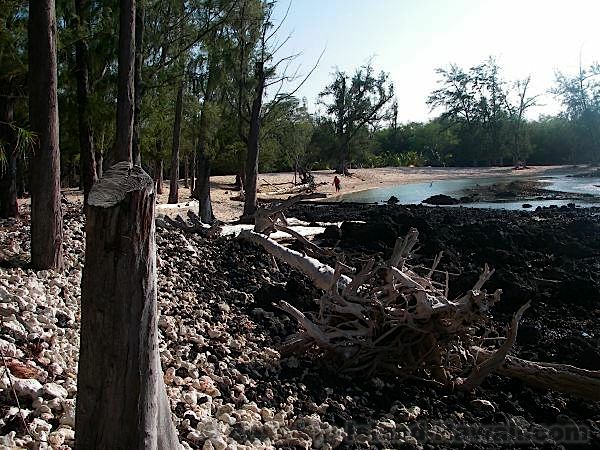 Now you'll still have to walk a few minutes through the gate and along the North most inlet of Makalawena. There are plenty of great places to spend the day right in this first area you come to. And this first inlet has the most shady spots. The swimming is the best in the second (middle) inlet. To get there, just keep walking around the first inlet 'till you come around the corner to where the sand becomes super fine and abundant. Before you decide on which way you'll get to Makalawena Beach, know that it takes about the same amount of time either way. Walking in from the South is less risky, especially if you're not confident in your 4 Wheeling abilities. The nasty drive is a unique adventure, but I'd generally recommend walking in from the south. Well, once you've arrived you don't need my help to know what to do. 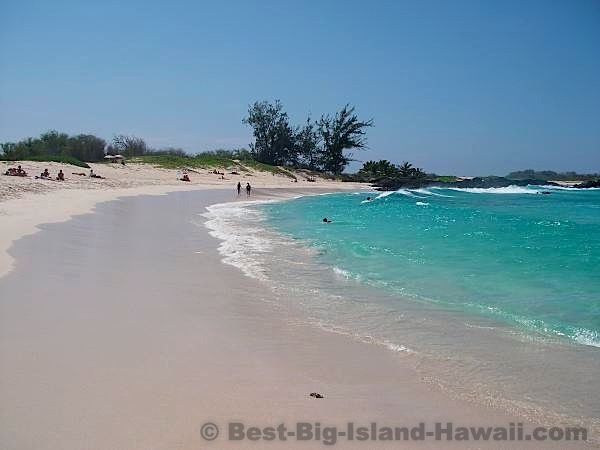 Lay out your towel and enjoy one of the best beaches that the Big Island of Hawaii has to offer. 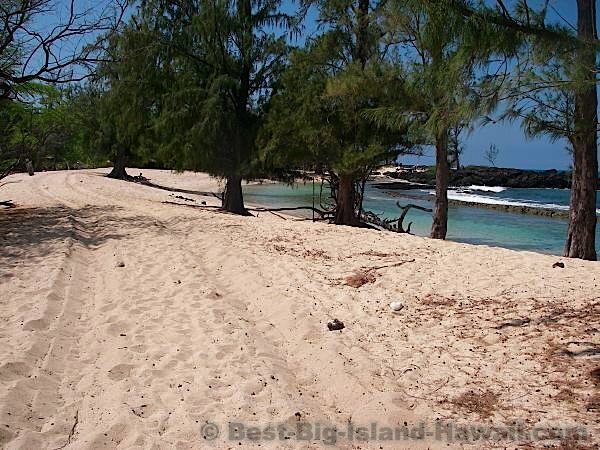 You'll get an extra little bit of enjoyment and satisfaction out of the fact that Makalawena Beach is tricky to get to. As with all beaches in Hawaii, please remember to respect the natural secluded beauty of this place by leaving it as you found it. Take everything away that you brought with you and take nothing away that you didn't bring with you (except beautiful pictures and pleasant memories). Watch Out For: The urge to call home and tell them you're never coming back.